"Many Happy Returns of the Day to our 'Ganagandharvan'"
Dr K J Yesudas celebrates his Birthday on 10th January, at Mookambika Temple! Family, friends and adoring fans joined in the celebration at the temple and Malayalees around the world wished the very best for their 'Dasettan' on his Birthday. 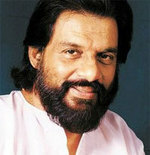 '10th January' is a special day for Malayalees and all those who love his inimitable golden voice. "We wish you happiness and health for now and always. May your days be filled with music and harmony for many many years. Please know that we love you and your music and a day without your music is unimaginable!" UPDATE: Please visit 'Malayalavedhi' for wonderful Malayalam songs!